Growing up our holidays were made up of family road trips to Mpumalanga with family and family friends. We had quite a huge family as that also included the extended family. My grandparents were very wise about it as they had a small car and then a bigger car that would be able to accommodate all of us for our road trips. 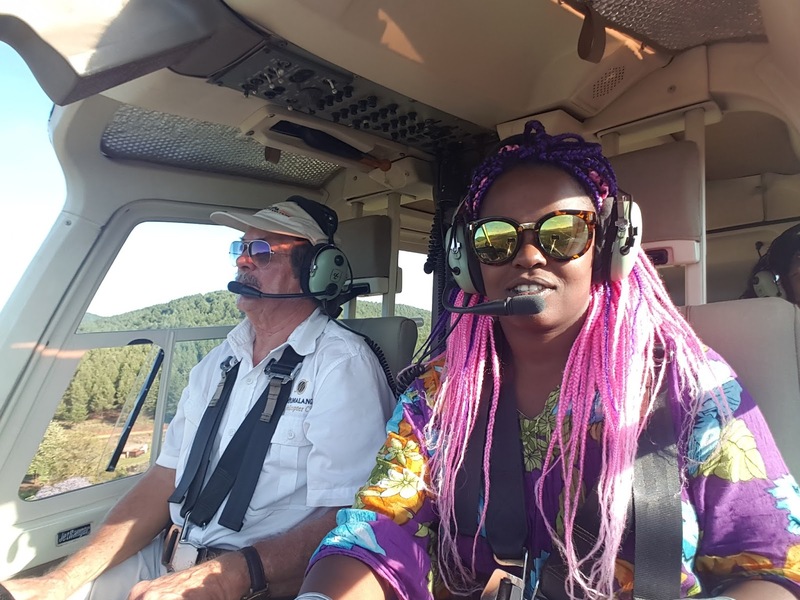 Every years we used different gates into the kruger National Park, and because the grandparents were such epic wanderlusters and road trippers - thats where I get it from - They knew how to do this travel business without breaking the bank. It was always self-catering chalets for accommodation. It was mostly the free things to do in the places we would visit so that everyone in the family was accommodated. 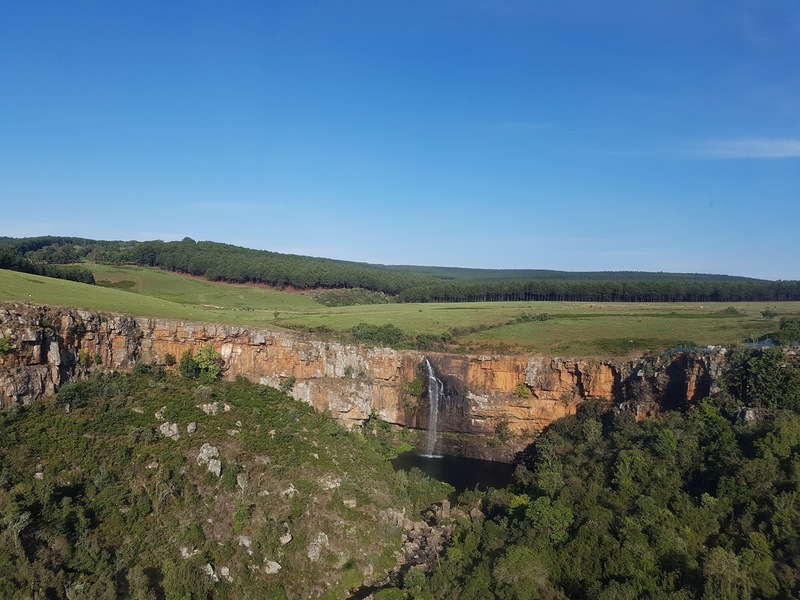 While in Mpumalanga, The must visit on the itinerary was always the Panorama Route. 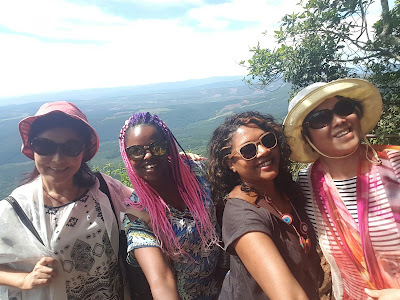 Whether we started it in Sabie where it begins at the Long tom Pass and went with it all the way to Hazyview or doing it the other way round it didnt matter. We knew there was plenty to see and do. We knew we would have the best picnics for lunch and get to learn how to swim, or practice our swimming as we didnt have pools at school or at home. Today I would like to share the Panorama Route in Mpumalanga's lowveld. This is the Panorama Route as i now know it as an adult. This time I get to do things that i was not allowed to do because i was too young and I do them and the grandparents laugh when I narrate how I am big now and I can do it all. I feel a bit rebellious but its so much fun. Growing up isnt so bad after all. 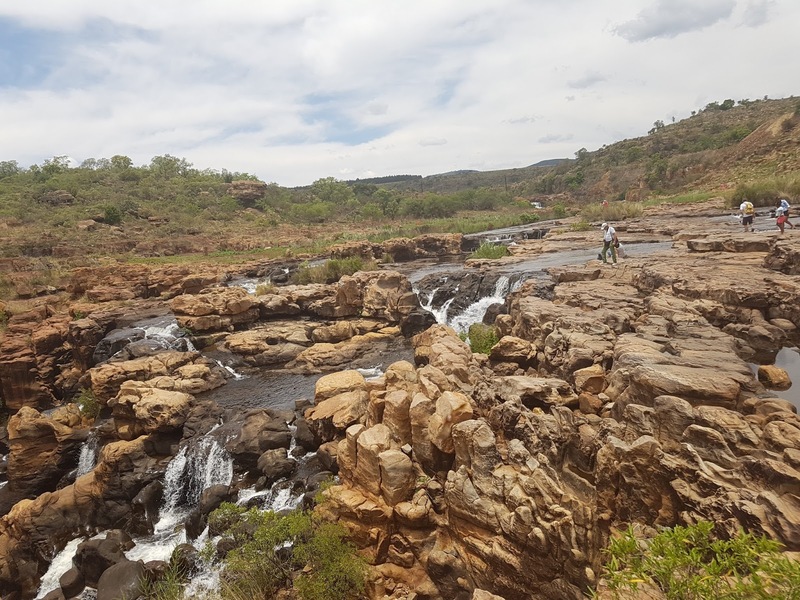 The Panorama Route is a scenic route in Mpumalanga that connects several cultural and natural points for interest. 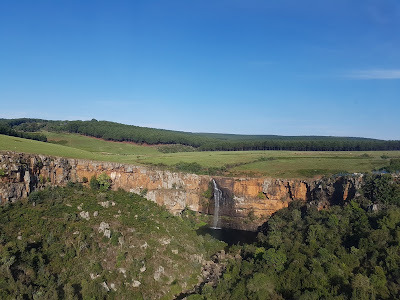 The route starts in Sabie at the Long tom Pass and continues through the lowveld and ends at the border of the Mpumalanga and Limpopo Province where we find the echo caves. 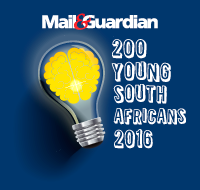 Lets start off in Sabie and work our way to the top. Also bare in mind that over the years what we did mostly for free there are now entrance fees. The fees arent that bad as they range from R10 -R20 a person and in some instances they charge per car. Sabie is a small town with lots of character. Surrounded by forests just like most small towns in the Lowveld. Make a stop and have a Pub Lunch at the Sabie Craft Brewery. They also offer Craft Beer tours and they have good Craft beers so more reason to go visit. 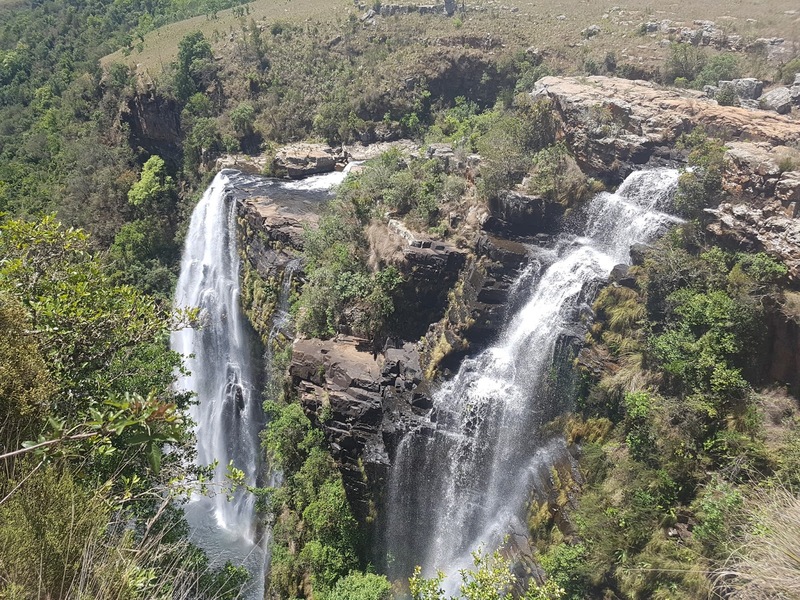 Just outside Sabie you will drive through winding roads to the Longtom pass. This is the beginning of the Panorama route. Here is a hotel called Misty Mountain lodge. Misty Mountain Lodge is a 3 star lodge and hotel. The establishment has 27 chalets that accommodate between 2 and 6 people and one self catering farmhouse that can take up to 10 people. They have a restaurant on the property if perhaps you dont want to go the self catering route. Epic views of the forests. The restaurant has a infinity swimming pool where you could also sit, sip cocktails or if you are like me, grab a beer and watch the sunset over the forests. Misty Mountain is owner managed and caters for small and large families. With jungle gyms for little ones and a trampoline for kids like myself. They also offer other activities such as quad biking. 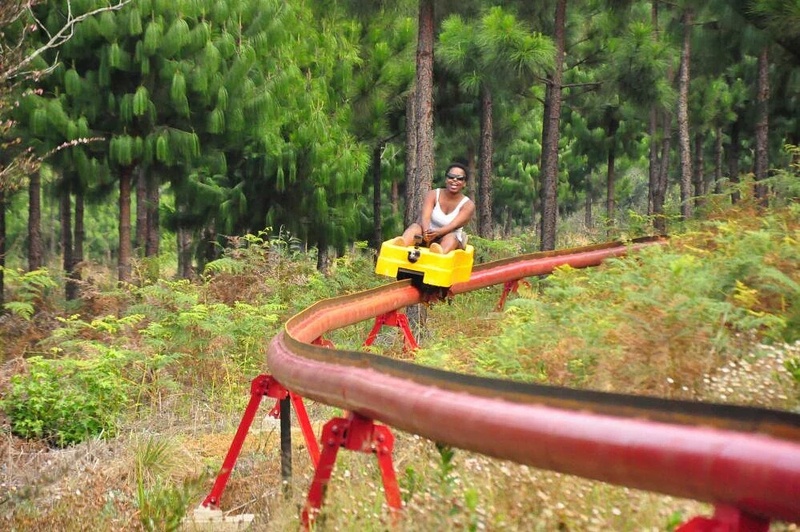 My ultimate favourite of the activities has to be the first ever in Africa, the long Tom Tobbagon. Here they drive you up to the top of the mountains, you get to sit and ride your way down through the valleys and the forests. 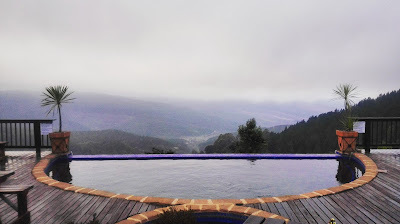 Up from Misty mountain, and find yourself at Mac-Mac pools. I have really fond memories of this place. 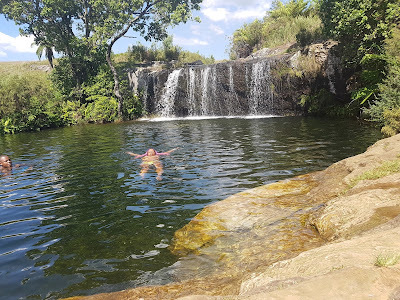 Mac mac pools is a river that flows through the lowveld, and at this point there are pools that you can swim in. There are immaculate lawns for your picnic and braai stands and lots of shade. The big pool has a waterfall. there are rocks at the bottom of the pool that look really close but because the water is pure and clean. Growing up we always saw older guys diving from the waterfall that seemed so high. In my head this waterfall was atleast 4metres high and I badly wanted to wanted to dive from the waterfalls - there were no parents to tell me I am not allowed to swim in the big pool. As the water flows from the big pool, it flows into the smaller pool and this is where we had to swim. And this is where we learnt how to swim. Uncle Sam taught us to swim in the smaller pools so this time I refused to swim in the smaller pool as I am older now and I have swam enough in the small pool. 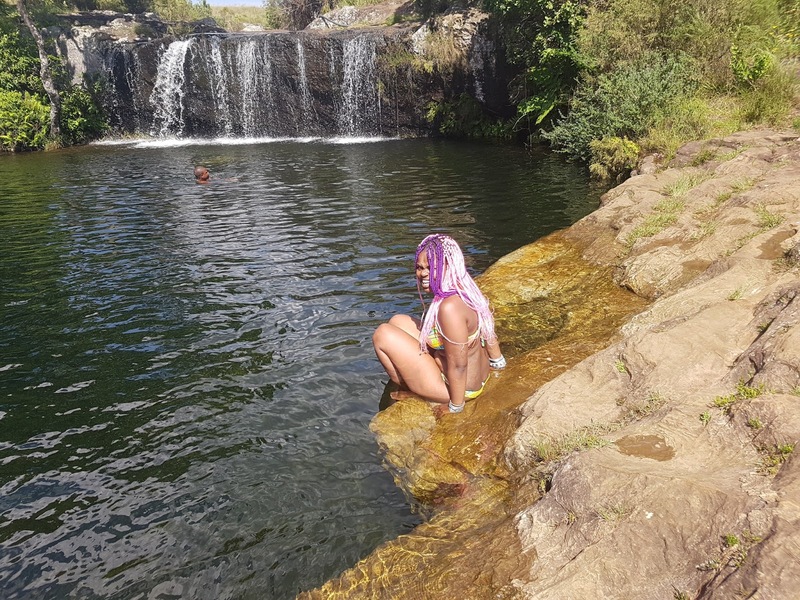 Because I am also wiser, i didnt risk diving into the big pool from the waterfall. So bring your picnic baskets and come have a braai with your family. No alcohol allowed as per the notice at the entrance of the pools. The entrance fee at Mac Mac pools is ZAR 20 per person. A 5 minutes drive from Mac Mac pools is where you will find Mac Mac falls. Here the water cascades down a 70m falls. The falls are named after the scottish miners who dug out gold in this gorge in the 1870's. The view point of the falls is protected by a meshed fence. You stand behind the fence and watch the spectacular twin falls plunge down the gorge with a rainbow over them. Near by the Mac Mac falls on the Panorama Route we have the Berlin and the Lisbon Falls. 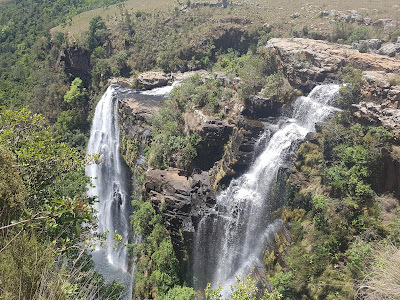 The Lisbon falls are the highest waterfall in Mpumalanga. They are 94m high and named after the capital city of Portugal. 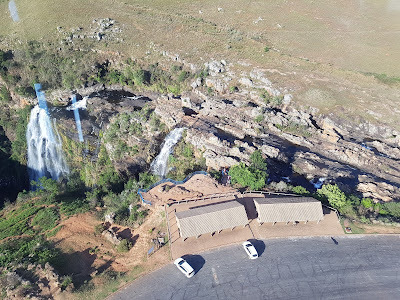 The entrance fee at the falls is ZAR10 per car. The view point is also protected by a mesh fence. The viewpoint is not as big as the other falls, so you wont find a lot of tourists here unlike the other falls where there will be buses. I have found that most people don't get the fascination or the point of the Pinnacle Rock. It's always like "Oh, is that it!" 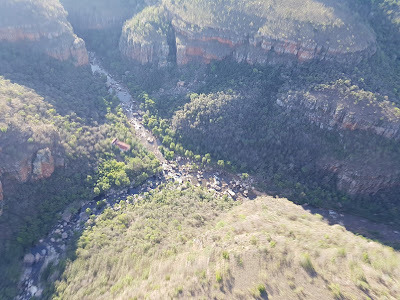 6km outside the small town of Graskop, is where you will find the Pinnacle Rock. It is a free standing Quartzite rock that stretches 30m above the dense indigenous forest. It is littered with stunning, brightly-coloured aloes. Entrance to see the Pinnacle Rock is ZAR10 per person. 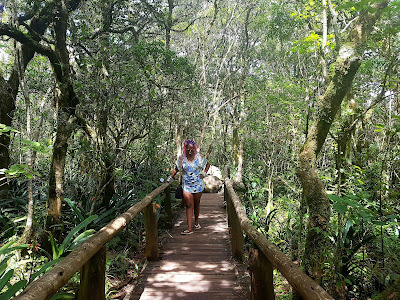 On the Panorama route is also where you will find the Blyde River Nature Reserve. The Reserve is situated in the Drakensberg escarpment region of eastern Mpumalanga. 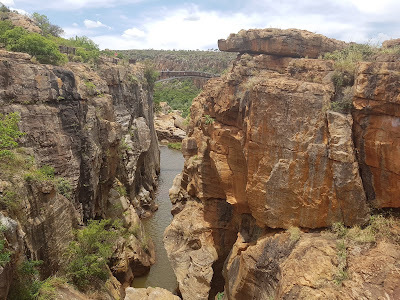 The Reserve is made up of Bourkes luck Potholes, Three Rondavels, Gods Window and the Blyde River canyon. 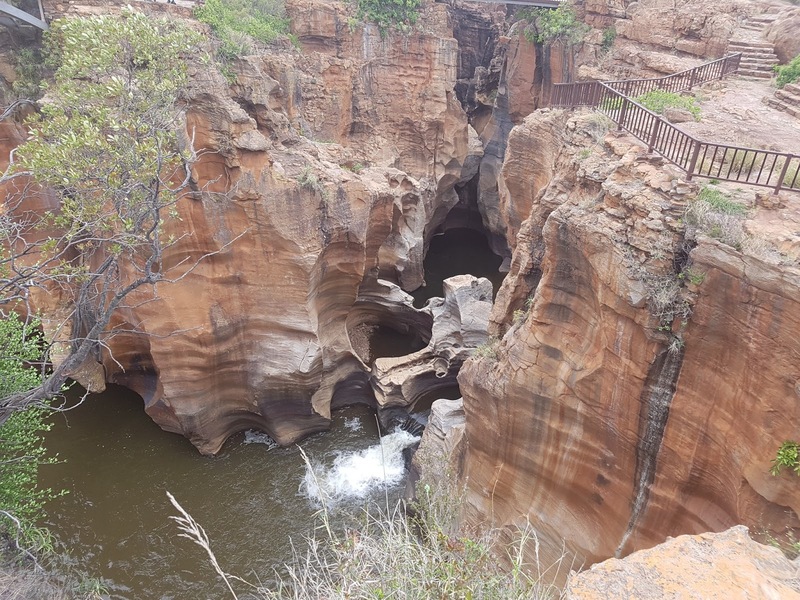 Bourkesluck potholes are situated at the confluence of the Treur and Blyde Rivers. the rivers flow into pots that form the potholes. The viewpoints are connected by pedestrian bridges. The entrance to the potholes is ZAR50 per person. from the parking area you will walk about 150m to where the potholes are. At the top a bit further from the potholes there are small pools for visitors to dip there feet in. Three Rondavels are three grass covered mountains with pointed peaks that resembles the African round houses. The mountains are named after the 19th century chief, Maripi. The flat top mountain is named "Mapjaneng" and the rondavels are named after three of his troublesome wives - Magabolle, Mogoladikwe and Maseroto. One a clear day the view point presents a spectacular work of nature. 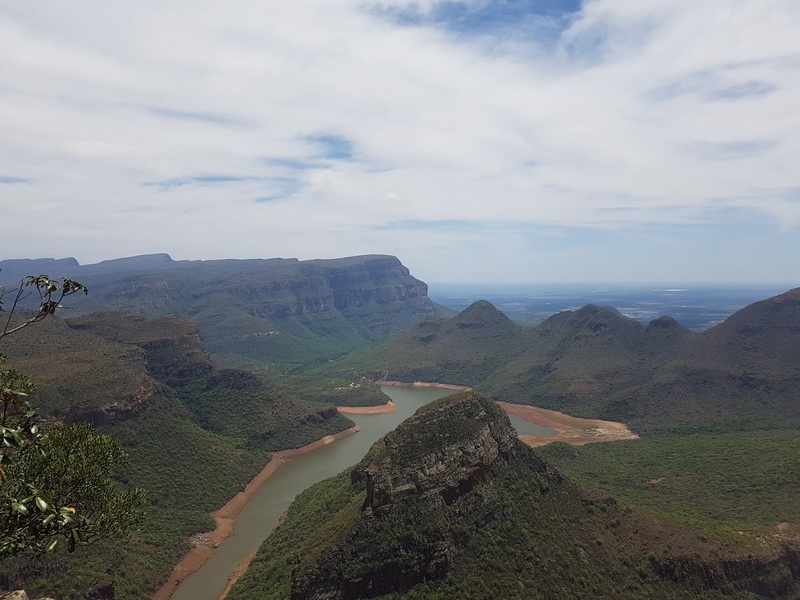 The Blyde river canyon is the third largest canyon in the world after the Grand Canyon in the US, and the Fish River Canyon in Namibia. It is also the largest green Canyon in the world. You are able to go on a boat cruise in the canyon. The view points are also fenced off. 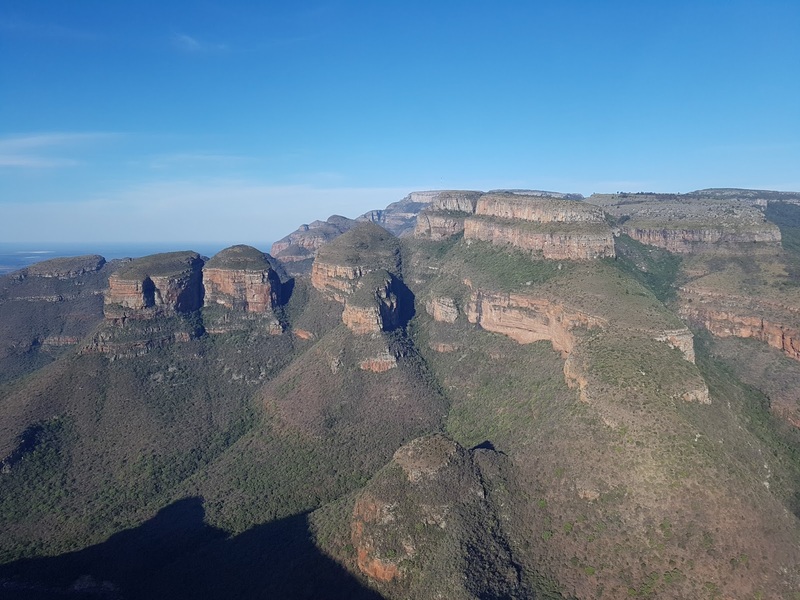 On your right are the Three Rondavels and to your left is the Canyon. It is also in the Canyon where you will find an old power station. At the confluence of the Blyde River and Belvedere River, at the bottom of the canyon is an old power station that is no longer in use. The machinery used in this power station was built in the UK and shipped to Cape TOWN where it was brought to the lowveld using Ox Wagons. A few metres above the power station is the old managers house which used to be rented out to travelers who were interested in staying there. The old manager house is no longer available to travelers and this is now a heritage site. I am still to confirm the name of the heritage site. Gods Window - Man, Gods window. This has to definitely be Gods view of the world. 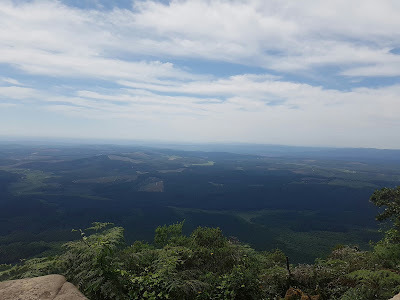 you stand up top as the escarpment lowers up to 700m adn you watch the lowveld. On a clear day you can see the Kruger National Park and as far as the Lebombo mountains bordering Mozambique. There are a few viewpoits of the lowveld at Gods window. There are a lot of stairs that you would have to walk up. Think of this as your exercise for the day. Further up is a rain forest which also have some stunning view points. 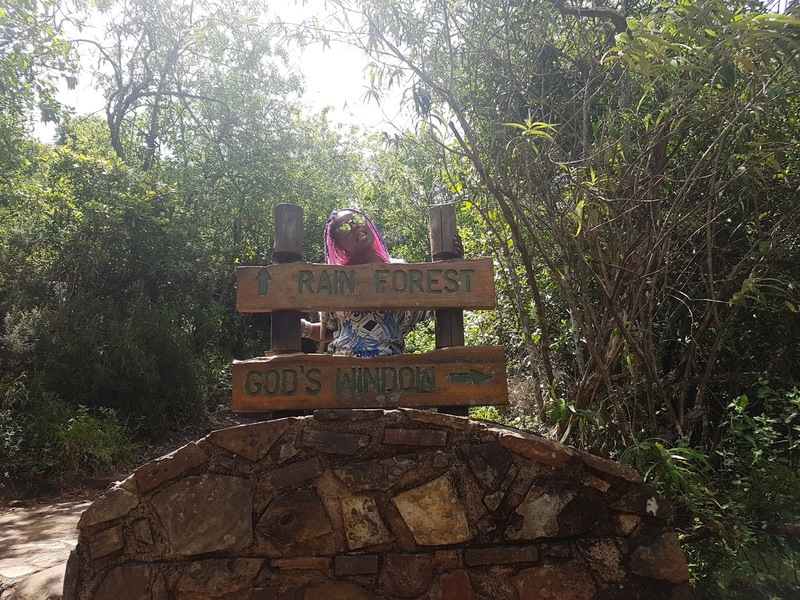 The entrance to Gods Window is ZAR10 per person. And right next to Gods Window is Wonderview. At an altitude of 1730m above sea level, this is by far the ultimate view point of the Lowveld. No walking necessary as the view point is right next to the road. And somewhere in the middle of all this epicness while you road trip through the Lowveld you wild find other gems. Gems you least expected. Gems such as the Potluck Boskombuis. Boskombuis is an Afrikaans word for Bush kitchen. And that's exactly what this is. An authentic restaurant on a private farm. With wooden tables and tree logs to sit on. The cutlery is the old school enamel plates and cups. The Bush kitchen serves authentic South African food such as boerewors and pap, T-bone steak and potjiekos. The food range between ZAR70 and ZAR130. The food is prepared in an open air kitchen on a fire as there is no electricity. The Treur river flows right there and you are more than welcome to go dip your feet while you wait for your meal. Bring cash for your food, cellphone reception is non existent in that part of the valley so don't expect to swipe your card. I have had the pleasure of driving up and down the Panorama Route and even if know there are some places I have not listed here. I recently was fortunate enough to drive the route but to also experience it from above on a helicopter ride. 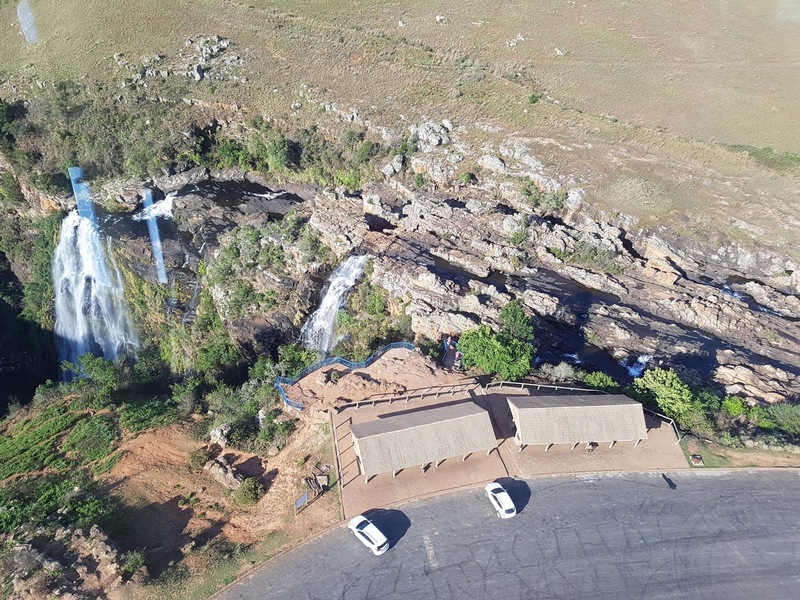 The Heli-rides are from the Hippo Hollow Hotel in Hazyview and are operated by the Mpumalanga Helicopter Co. Please Note: Payments for entry into all these places of interest on the Panorama Route are all cash and a receipt is available upon request. Bring comfortable walking shoes. Not necessarily hiking boots as your trainers or hiking sandals will also be good enough. Sun screen is a MUST!!! All the places have curio stores here local sell their art and other hand made goods, however there are no stores. so pack a cooler bag for your refreshments and bring a picnic basket for your lunch. The best way to get around Mpumalanga is by car - a self drive is ideal and saves time and costs. 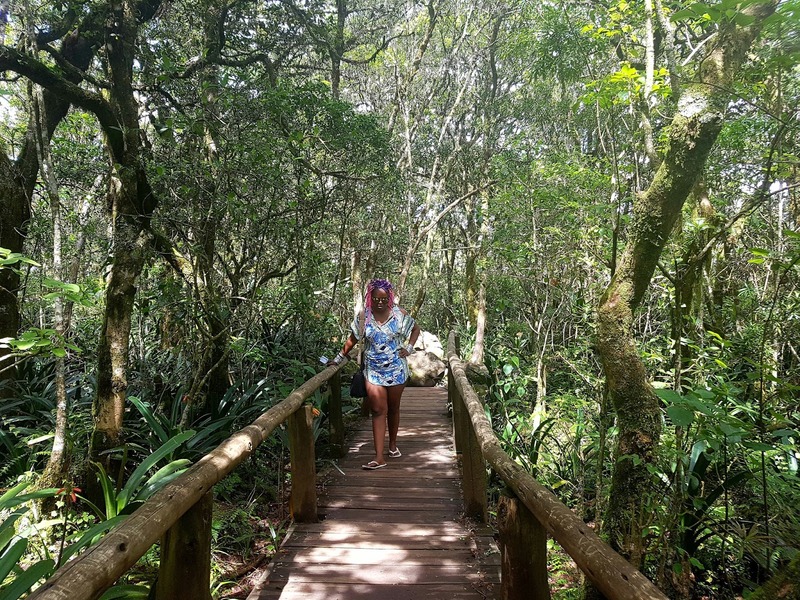 Go experience Mpumalanga beyond wildlife this festive season. And remember to share your posts on social media under #ExploreMpumalanga so we can all share in your adventures. 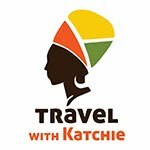 Katchie is an African adventurer passionate about decolonising African travel and showcasing the best of African destinations - one country at a time. Travelling from Addis Ababa in Ethiopia to Khartoum, Sudan.